What to plant and where? Life's unanswered question finally....answered. These and other tree care questions are addressed by Jim Woodworth, Casey Trees Director of Tree Planting and certified arborist, in his Right Tree, Right Space lecture this Saturday afternoon as part of the monthly Urban Gardening Talk Series hosted by the Historical Society of Washington, DC Urban Gardeners, and Washington Gardener Magazine. 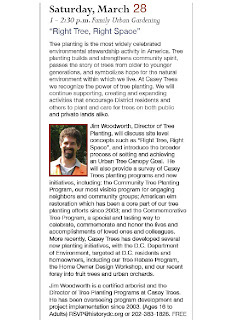 Jim will discuss site level concepts, how to select the appropriate tree to meet your specific needs, basic tree care, and the various programs that Casey Trees offers to assist DC residents and groups plant trees in their neighborhoods including the Tree Rebate and Community Tree Planting programs. To view the Right Tree, Right Place checklist and other Casey Trees-developed planting resources, click here. The class is FREE and registration is not required. However, you can email RSVP@historydc.org or call 202-383-1828 with any questions.